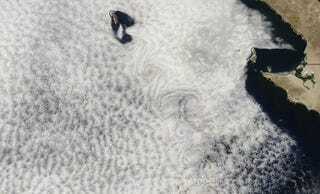 In this satellite image from NASA, we see breathtakingly beautiful swirls of cloud that are also iridescent. It's an unusual combination of two atmospheric phenomena of the coast of Baja California: von Kármán vortices and a glory. Von Kármán vortices are the swirls caused by peaks poking up into the cloud deck, turbulence swirling the atmosphere like a rock in a stream. Because the weather phenomena is directly tied to geography, it is common to see the vortices show up in the same location repeatedly over time. Glories are rainbow iridescence in clouds formed by water droplets scattering sunlight. If the droplets are just the right size, the light is scattered backwards, creating rainbow clouds. While we usually see glories as circular halos, the NASA satellite captures photographs in bands as it orbits, imaging the glory as a pair of elongate bands instead. While far less unusual, I'm also loving the cloud deck with hexagonal cracking, a typical cooling pattern I see more often when looking at drying mud or columnar basalts.